Zoeftig is delighted to be unveiling its newest waiting area seating solution, the stylish and flexible Contact seating solution, at this year’s Passenger Terminal Expo in Stockholm, Sweden. Contact is a statement piece of furniture, perfect for any waiting area thanks to its modular nature and clever mounting design that means it can be fitted with a wide range of attractive seat centres. 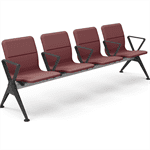 Zoeftig’s team of experts will be on Stand 400 from today (Tuesday, 20th March) until Thursday showcasing the new seating solution to visitors at what is the world’s leading international airport exhibition. Paul Williams, CEO of Zoeftig, said: “Our latest product continues to revolutionise the style, comfort and functionality of airports and waiting areas. The clean lines and refined touches of Contact are supported by an ergonomic and innovative design that features refreshed structures, alongside beam and support systems. 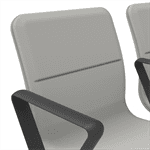 In addition, the seating solution has been sustainably manufactured from recyclable materials. Visit the Zoeftig Twitter and LinkedIn pages to keep up to date with the latest news from the event.